Oak Trees 101: What You Need to Know | Mr. Tree, Inc.
An oak tree can be the leafy centerpiece to any landscaping plan. There are more than 400 species of this deciduous and evergreen tree in North America and though the oak tree is common to any park, playground, or outdoor space in the U.S., the rules for its care and maintenance is not always common knowledge. For instance, you may not know that oak trees come from those friendly, little acorns you find on the ground! If you’re looking to provide some shade for your outdoor space before the hazy days of summer or want an accent tree that is hearty enough to last for generations, an oak tree might be the tree for you. But how can one care for the tree once the roots have been carefully planted in the front lawn? A local tree service may be the best place to get your start. The first things you must decide before taking the oak tree plunge is if you want a red or white oak. Though there are other varieties of oak trees, these are the two most common and can be told apart from their distinctive leaf pattern. A red oak tree has bristly leaves, whereas white oak leaves are smooth. Once you’ve decided which tree is right for you, you can move on the the second step. As mentioned above, one of nature’s most surprising gifts is that the seeds of oak trees can be found littered in any schoolyard or wooded area. Acorns are abundant, particularly in autumn from September to November, and as long as the seeds are plump with no splinters they can be planted directly into the ground. If you want to plant a red oak acorn, hold on to the seed until the next planting season—red oaks need two seasons to mature, but a white oak can be planted the same day as when you found its acorn. If planting an acorn seems like too much work, a local tree service or nursery might have tree saplings for sale. Saplings are seeds that have already been germinated and have sprouted the beginnings of a tree trunk. Saplings can be transported from store to home easily and require less waiting time. Once you have your sapling in hand it’s time to pick the perfect spot to plant your tree. Try choosing a spot that is far from the curb or street and think ahead to when your oak will be mature and thriving. A full grown oak will need a lot of space! Once you have your desired spot, dig a hole that is three times the dimensions of the root ball of the sapling and check the soil for pest infestations or fungus. Place your sapling into the hole that you’ve made and cover it with the soil you had previously removed. Voila! A tree is born. Pests, disease, and fungus are common in all outdoor flora. But for the oak tree there are a particular set of problems that can decline your tree’s health. Insects such as caterpillars, aphids, borers, lace bugs, and leaf miners can chew away at the leaves and branches of your oak. While disease such as, root rot, canker disease, fungus, and powdery mildew will cause symptoms like discolored foliage, dead leaves or branches, and even a white coating on your tree’s trunk. Take your tree’s infestation seriously and contact a local tree service to get your tree inspected. Cabling or bracing your oak is a good way to provide support to your tree while it grows and matures. Cabling can offer respite to limbs that are buckling under the stress of heavier branches and can sometimes be a good way to anchor new trees as they grow. Once your tree has matured it will most likely need to be pruned to keep it healthy and lively. Pruning is the removal of dead branches that can greatly impact the yield of healthy, green leaves in your tree and can also prevent any precarious branches from falling and causing injury. One way to tell if your tree is in need of pruning is to look at the canopy—or the outer layer of leaves—to see if the limbs are looking heavy. A heavier limb is more likely to break off causing property damage, road blockways, and damage to the tree. However, pruning should also be seen as routine maintenance and a good way to keep a tree healthy. One you’ve determined that your true needs to be pruned, call your local tree service and hire a professional to come and remove the dead branches. A reputable company should be able to skillfully remove dead branches and be fully licensed. Much like our hair or even smaller household plants, trees need to be trimmed in order to look their best. Trimming can be helpful to improve the quality of life of a tree and can be an efficient way to make your tree look better. And similar to getting a haircut, the goal of a trim is to be pleasing to the eye and requires artistry and skill. A “wild” looking tree may be pleasing to some, but the growth of your tree’s branches can affect other things such as how much shade or light your yard (and other outdoor plants!) will receive. If you’re looking for your oak to be carefully trimmed into an intricate design, a tree shaping might also be worth considering. Shaping is the manipulation of the growth of your tree and along with a tree trim can make the difference to the look of your home. 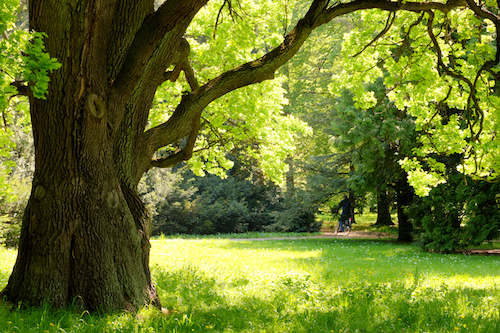 If you’re looking to keep your oak in tip-top shape, Mr. Tree are the experts at tree maintenance and care. We offer services that not only will maintain the health of your tree, but we can work with your oak to make it blend seamlessly into an existing landscape.